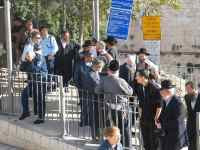 The present-day Sanhedrin Court ( http://www.thesanhedrin.org/en/ ) decided Tuesday to purchase a herd of sheep for ritual sacrifice at the site of the Temple on the eve of Passover, conditions on the Temple Mount permitting. The modern Sanhedrin was established several years ago and is headed by Rabbi Adin Steinsaltz. It claims to be renewing the ancient Jewish high court, which existed until roughly 1600 years ago, and meets once a week. Professor Hillel Weiss, a member of the Sanhedrin, told Haaretz on Tuesday that the action, even if merely symbolic, is designed to demonstrate in a way that is obvious to all that the expectation of Temple rituals will resume is real, and not just talk. Several years ago, a number of members of the various Temple movements performed a symbolic sacrifice on Givat Hananya, which overlooks the Temple Mount from Jerusalem's Abu Tur neighborhood. During the ceremony, participants sacrificed a young goat that was donated by a resident of Tekoa. 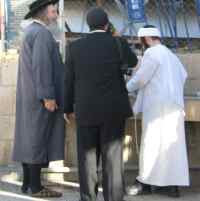 The participants also built a special two-meter tall oven, in accordance with halakha (Jewish law). The Passover sacrifice is considered a simple ceremony, relative to other works performed in the Temple. On Wednesday, the Sanhedrin will hold its main conference, entitled "Existential threats and ways to correct them." Rabbi Menachem Froman, far-right activist Moshe Feiglin, and Nativ editor Arieh Stav will participate in the conference. The guest of honor will be Makor Rishon publisher Shlomo Ben-Zvi.